Well, the technology world has gone nuts these past few days in anticipation of the iPhone's debut today. I stopped by my local Apple Store today to see what the line was like and I was astounded. I would guess there were about three or four hundred people waiting in line (and this is at the smaller of the two San Diego Apple Stores). 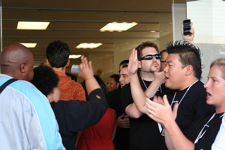 What amazed me the most about the line waiters was that they were far from the typical Apple fan crowd that can usually be seen lining up outside Apple Stores for OS X releases or other events. The people there ranged from babies to the elderly and came from all sorts of diverse backgrounds and fields. It looks like the iPhone has struck a chord with a much greater audience than typical Apple users, which is certainly a large part of Apple's goal for the product. I have posted a couple pictures from the event on flickr here just to give you an idea of the scene here at the San Diego Apple Store.